While working on Lil’ Suzy. We came to appreciate the painted Classic boats. As beautiful as Varnish is. For a change it’s cool to apply paint. And I mean not just a coat of white paint. Try something fun, like a Shark mouth. Or orange paint. Wow, what a fun color choice for the time and it looks fantastic. For something even more radical. These two Barrel Backs show the contrast. Both are as done this way at the factory. One for racing, one for bragging. You can see how varnish became a thing of the past. All the boats looked the same. Not to mention a pain to work with. Paint was a cheap way to differentiate them, and held up longer. 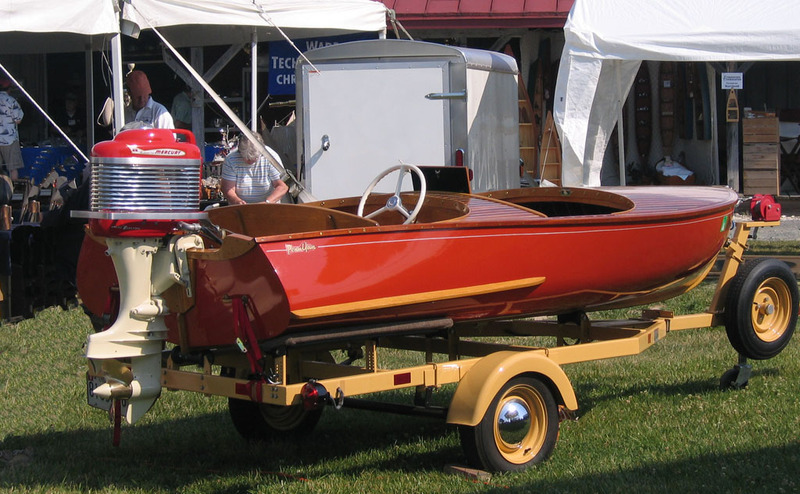 Later in the 1960’s many hulls were pretty much the same, only the hardware and color was different. For your Antique or classic woody though. Paint is a fun option. But only if your boat came that way. There are many that came painted, Chris Craft Rockets, Expresses, Barrel backs, Racers. Gar wood has some painted boats, As did Century, with some very cool stain options. We will always be on the look out for more. Please send photo’s if you have a great painted woody boat. In the Chris Craft fleet, it was common practice to paint the pre-war Racing Runabouts. Most of the others, including utility vessels were stained and varnished prior to WWII. Mahogany was the primary wood of choice for boat building but Philippine mahogany (not true mahogany) became the major wood source (supply and demand). Between 1942 and 1945 Chris Craft was busy building landing craft and other boats for the war effort. After the war Chris Craft began production using other kinds of wood for some of their boats. I’m thinking it took them quite a while to re-establish regular shipments of Philippine mahogany after the war. In this period select wood was used sparingly and a lot of painted hulls were the result of their effort to produce presentable looking boats. 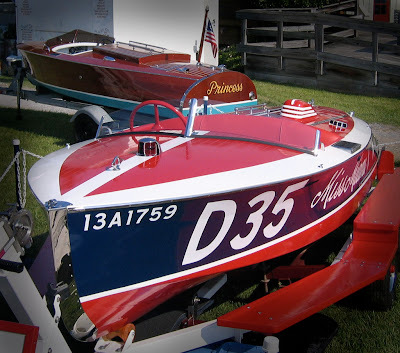 I’m sure that it must have taken a new marketing strategy to convince buyers to purchase these painted boats at the time. By the very early 50’s most were back to showing wood grain.